This is a translation of Topias Uotila‘s blog post “Ohjuspuolustus Euroopassa” published on 14 June 2016 in Ulkopolitist.fi blog. Uotila is an avid security policy enthusiast with wide leadership experience in business. This translation and its publication were done in collaboration with the author and the Ulkopolitist. The combination of nuclear weapons and ballistic missiles brought about the biggest change in the history of warfare. These technologies not only gave the possibility to start a war with immediate strikes to any target but also made defense near impossible and finally, raised the stakes of wartime destruction to a matter of human existence. The much debated US missile defense system in Romania came online this May. The nature of the missile defense has also been discussed among Finnish commentators. The US has stressed the threat of Iranian ballistic missiles, whereas Russians have felt it was a move against them. In order to understand this debate and the meaning of this missile defense system in particular, one must know a few underlying facts about nuclear weapons, missiles, and geography. The purpose of this piece is to bring such facts into light and to analyze the strategic role of the US missile defense. A ballistic missile is usually accelerated with a rocket engine onto a trajectory that is guided only very little during the flight. Thus the trajectory of a ballistic missile is similar to that of a thrown object. With large distances the peak altitude is beyond the atmosphere reaching up to 1200 km. This allows the missile to have a limitless range and a very high speed (e.g., 7 km/h). Ballistic missiles are classified by their range. The missiles of the shortest range are hard to distinguish from rocket launchers, intermediate range missiles (500 – 5500 km) launched from land are banned by the INF treaty, and missiles above 5500 km range are called intercontinental ballistic missiles (ICBM). Duration 5 minutes. Acceleration to speeds up to 8 km/s and reaching the altitude of 400 km. Duration about 25 minutes. Practically above the atmosphere. Duration 2 minutes. Begins at the altitude of about 100 km. Additionally, anti-ballistic defense systems can be classified by the phase of the trajectory during which the interception is performed. Currently, there are two strategic defense systems: Russian A-135 around Moscow and US’ GMD (Ground-Based Midcourse Defense). A-135 is actually a result of a project started in the 1950s based on the needs to protect Moscow at the time. GMD, on the other hand, is based on the latest concepts and ideas that haven’t achieved fully operational status. The need for such systems has been smallish due to the Anti-Ballistic Missile Treaty (ABM) signed in 1972 that limited both sides to one system protecting one target and to a hundred interceptor missiles. The main practical differences between the two existing systems are as follows. First, the US has rescinded from protecting against a nuclear strike with another nuclear warhead and aims to simply crash the interceptor into the target missile. Second, GMD uses widely spread missile sites to protect larger areas such as the whole US instead of a single location. The GMD system was justified with the thread of the ‘rogue states’ after the 9/11 terrorist strikes and the development of this defense capability was deemed so important that the US withdrew from the ABM treaty in 2002. Europe was initially to have several parts of this same system. This, as expected, irritated Russia greatly as well as some of the NATO countries that were left out of the decision making. President Obama rescinded the plan involving GMD for Europe and now the European missile defense system is called European Phased Adaptive Approach (EPAA). EPAA is not based on the GMD technology but on the US Navy’s AEGIS system. It’s a strategic range, flight phase interceptor system. However, it can only counter intermediate range ballistic missiles with ranges less than 5500 km. Its operational effectiveness is based on the radars, launch platforms, and the interceptor missiles it uses. The missile used by EPAA is RIM-161 Standard Missile 3. The subversion in current use is Block IB and Block II is estimated be in use by the end of 2018. The current missile has such a low range that it can intercept only few ballistic missile types during their flight stage. Block II’s capabilities seem to be adequate for this task. Even though the range of the new missile is long, its speed is low enough to make reaching the target very challenging. Assume, for instance, that an anti-ballistic missile is launched 900 km from a predicted point on the target’s trajectory that the interceptor could reach in 200 seconds: the targeted ballistic missile would travel 1400 km during those 200 seconds. Therefore the target’s trajectory must be precisely known in advance in order to make interception possible. 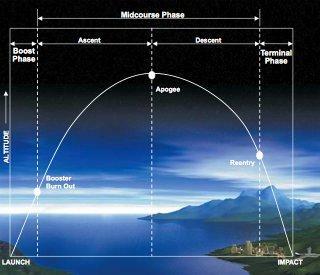 It is very difficult to determine the trajectory with enough accuracy based on the launch phase of a ballistic missile. It’s hard to say what the missiles can intercept based on their specifications alone as the flight speeds both missiles, detection distances, and the angles of interception all play a role. US view of the challenge of speed: interceptor missile can’t reach the ICBM even with the same maximum speed and a range of 5000 km. Credit: Wikipedia. The EPAA can use all 33 naval vessels with AEGIS AMB capabilities as part of the system. 14 of them are in the Atlantic Fleet. A central part of the system are the ground stations on the coast of Poland and in Romania. There are two radar stations – a SPY-1 radar that was just placed in Romania and an AN/TPY-2 radar previously set up in Turkey. SPY-1 is the same that AEGIS vessels have whereas the latter is a less capable radar of the THAAD system. Based on this, neither of them have unprecedented capabilities. The US has said that missile and nuclear technologies will spread to the rogue states in time. These states such as North Korea and Iran are thought to be building a capability to launch a single ballistic missile that one naturally needs to intercept. Geographically, as far as Europe is concerned, this only means Iran. It is the only state in this region that US sees as posing a threat in the foreseeable future. Even listing Iran can be considered somewhat odd since the closure of Iran’s nuclear weapons program was just agreed upon. A ballistic trajectory from Iran to central Europe. Credit: Great Circle Mapper. The locations of ground stations for an Iranian threat are mostly logical, but one might ask why Poland’s station is so far north where a sea vessel could do the job. Southern Poland would be closer to possible missile trajectories from Iran, but on the other hand it is also very close to the ground station in Romania. The ground stations as far as capability is concerned shouldn’t pose any greater threat to Russia than Navy vessels already do: the locations of the ground stations are known and thus their activity can be better taken into account. Russia has communicated that the EPAA system shocks the strategic balance between superpowers and that EPAA has an offencive capability. Russia feels ‘forced’ to counter the move with actions of its own. There have been talks about a withdrawal from the INF treaty in particular and placing Iskander missiles in Kaliningrad. Iskanders are short ranged ballistic missiles that would reach the missile defense station in Poland. This threat might be based on the idea that the advanced flight patterns of Iskander missiles would be beyond the capabilities of the interceptors the Poland ground station is using. However, there are missiles designed for such interception that work with the same Mk41 launchers. Russia has stated that the INF treaty has become obsolete due to the current aircraft speeds and new NATO bases. The flight speeds of aircraft have not, however, increased since the Cold War. The purpose of the INF treaty was to lengthen the flight times in order to increase the time window for a counterstrike decision. According to the argument this doesn’t work anymore when a flight from the Ämari air force base in Estonia to bomb St Petersburg takes only 10 minutes. Some have voiced suspicions that Russia itself could be developing missiles specifically for the Iskander platform that would be in violation with the INF. An example trajectory from central Russia to Chicago. Credit: Great Circle Mapper. The missiles flying closest to the coastline of Poland would be launched from the Kozelsk base to Miami over southern Sweden and Norway and flying closest to Poland at a distance less than 700 km. However, Russia should have no reason to launch missiles to Miami from this base, and as seen below even these missiles would be easier to intercept from the sea or from Norway. The trajectory closest to central Europe between Miami and Kozelsk. Credit: Great Circle Mapper. In addition, there is a central challenge in missile defense that is an economic one: interceptors may be more expensive than their targets, and multiple interceptor missiles may be needed for one target. The planned 19 Block II missiles are then a very small number compared to Russia’s 489 ICMBs. One might think that the number of missiles available for launching a counterstrike would be greatly reduced. This isn’t the case in practice because the counterstrike is based on launching before the first strike would reach its targets as well as on submarines that the first strike would be unable to neutralize. These trajectories are naturally quite far from the Eastern Europe. Russia’s emphasis on mobile missile launchers are a sign that even ground based missiles will be resilient enough to make interception of a few missiles negligible. Transforming Mk-41 launch pads into an offensive weapon is possible: they could be fitted to launch Tomahawk cruise missiles. However, Tomahawk missiles don’t currently have fitting nuclear warheads, and as a cruise missile with low speed and flight altitude they are vulnerable to regular anti-aircraft equipment. As Tomahawk is widely used by the US Navy and only by them, it would seem curious to think that two launchpads fitted for them would constitute any significant change – especially when such use would be a violation of the INF treaty. It has become obvious that the EPAA system has indeed a great importance to both sides. There has even been speculations that the treaty to limit conventional weapons was brought down because of it. What is the real significance here? The significance isn’t likely some of the reasonable and innocent sounding objections that Russia isn’t raising, such as Russia would be afraid that its satellites would be destroyed or that it doesn’t want Iranian missiles intercepted in its airspace. Neither is Russia complaining about the missile defense systems in Japan, Alaska or Washington even though these systems are operational and developed for more realistic needs. (After the publication of the Finnish version, Russia has voiced objections to missile defense efforts in Asia.) They are also partly more capable systems than the one in Poland could be even at its very best. So it seems that it isn’t about the US but rather about Europe. And in Europe it has to do with gaining influence – and the intermediate range missiles. The most concrete purpose and benefit both for the US and for the countries on whose soil parts of the system are located is its potential to intercept intermediate range missiles, if and when INF treaty will be violated. These states are therefore ensuring that the US has an interest in their defense; even if the US troops in the Baltic would have their Dunkirk moment, it is certain that the Polish station couldn’t be left to the hands of Russians even if it would be just to keep the technology secret. The US, on the other hand, knows that it has more say in the matters of the host countries even if the overall power benefit seems to more on the hosts’ side. Thus the missile defense has a role somewhat similar to the tactical nuclear weapons the US has lent to some NATO countries; these are relatively small impact weapons carried by aircraft without strategic or anti-missile significance. The situation with trajectories is entirely different if one is targeting central Europe. The range, however, is specifically banned by the INF. Credit: Great Circle Mapper. Should a nuclear war develop through more or less controlled steps of escalation rather than with a full first strike, the EPAA system can intercept or make uncertain the neutralization of a few targets. For example should a war between NATO and Russia turn towards heavy losses for Russia and the front began to move towards Moscow, Russia could according to its current doctrine use nuclear weapons against the advancing army, their logistics, or even a city in a NATO country. EPAA could prevent a strike against Amsterdam, Paris or London, or force Russia to use a greater number of missiles rather than just a handful. This could have significance by for example making it impossible for Russia to claim multiple launches a mishap. It seems very likely that both the US and Russia share a view of the true significance of the missile defense in Europe but choose not to say it as it is. First of all, the new European missile system is a way to consolidate political influence but in the background there is a belief that the other side is already in breach of the INF treaty. Maybe because their own side has already done so. The return of intermediate range missiles is something that will really change the strategic picture – something the European missile defense can’t do.